How Far Along: 28 weeks. I’m in the home stretch, the final trimester of my pregnancy with this little blessing. 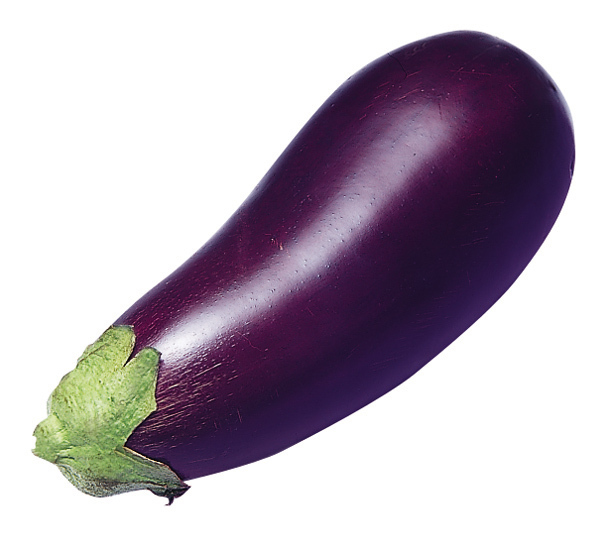 Fruit/Object: Still an eggplant I guess...I can't find anything else really. Size: Baby is weighing in at 2.5 to 3 pounds and about 16 inches long from head to toe. Baby changes: Your baby is settling into the proper position for birth, with his head facing downward (toward your body's nearest exit!). Your little work in progress is now about 2.5 pounds and almost 16 inches long. She's busy adding new skills such as blinking to an already impressive repertoire of tricks like coughing, sucking, hiccuping, and taking practice breaths. Your baby's sleep now includes the REM (rapid eye movement) phase — and that means he could be dreaming already (what do you suppose he's dreaming about?). Though her lungs are nearly fully mature (so both of you might breathe a little easier if he were born now), your baby still has plenty of growing to do. Best Moment this past week: It’s been my pool time. :) Blake bought me a blow up pool that is actually big enough for both of us and the water comes up to my chest. It’s so nice with these hot days and I look forward to my lazy Saturday or Sunday afternoon floating around. I lay my head back on the blown up side and I bought a short pool noodle to rest my feet on and I float and get some sun. It’s also helping with my swelling. By the end of the week my ankles literally have rolls on them! Haha! But, after the weekend and my pool time they are back to normal, ready for a new week of growing and swelling. Ugh. This is like the pool Blake bought me! 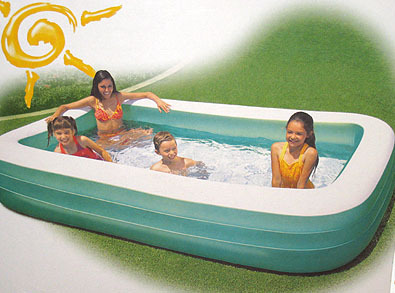 It's perfect and just big enough for me to float in. I look SO hot in this classy blow up pool in the backyard! Food Craving: I haven’t really had too many “weird” or “crazy” cravings. I just need food often to keep me from feeling sick. What I miss: Feeling in my right arm and hand. I think I have carpal tunnel but I’m not too sure. My OB recommended that I go to an acupuncturist and I’ve been twice now. It’s helped slightly but not 100% I also go to a chiropractor, I have since middle school because I have always had a bad neck and back, but hopefully between the two of them they can “fix” me. *As predicted this hasn’t changed…still peein’ up a storm, keepin’ me awake! What I am looking forward to: This next week I am off Thursday through Tuesday of the next week. 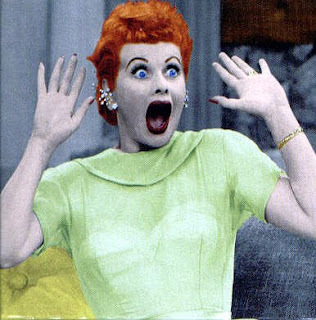 We have my nephews coming into town, a get-together at our friend’s house, and of course INDEPENDENCE DAY celebrations! Symptoms: I guess the calendar knows when the 1st, 2nd and 3rd trimesters begin but this pas week my body thought that the third trimester started early. I’ve been exhausted like I was in the first trimester. I could take a two hour nap in the morning and another two hour nap in the afternoon after lunch. I’m told it’s going to get worse but I pray it doesn’t. I guess it’s the waking up twice a night to pee and then not being able to get back to sleep after the 4 am wake up that’s absolutely killing my energy! 1. 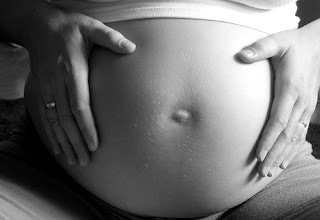 Please don’t touch a pregnant lady’s belly unless you know her and know her well. My husband, parents, in-laws, siblings and close friends are more than welcome to rub-a-dub on my fat stomach as much as they’d like. This is “their baby” as well. I just think if you see someone at work that you see only in passing you should keep your hands off of her belly. It’s uncomfortable. If I weren’t pregnant I guarantee you that you wouldn’t even say hello to me let alone touch my stomach. If you don't know me, please don't touch me. Thank you! 2. 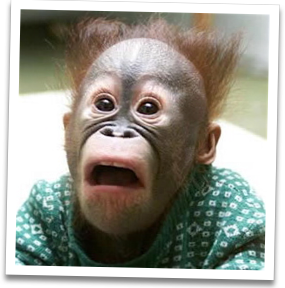 When someone calls to tell you that they are expecting, even if it is a total surprise, don’t say, “WHAT? !” and hang up on them. Yes, that actually happened to me by a “friend.” When they called back the person said, “Well, I’m happy for you, I’m just jealous.” Don’t say that either. :) Fortunately, I wasn’t expecting a great reaction from this person anyway so all is not lost. I have found that some people in your life will be beyond ecstatic for you and some people just can't be happy for anyone or anything that is happening to someone else. This comes to every aspect of life and you really do have to just brush the chip off your shoulder and work on being happy for those around you as well. 3. Don’t tell horror stories. I may or may not have my own but just let me see on my own if I do. I don’t need to be worried for months and months of what is to come. I like to be educated and know what is coming but not ALL the gory details. "Ok, you're really starting to freak me out..."
4. Keep your personal pregnancy preferences to yourself. If you had a 100% caffeine, drug, sandwich, stress, dust, and allergen free pregnancy I’m very happy for you. Please be happy for me as I sip on my 1 cup of coffee a week. I have a wonderful doctor who’s been an OB for over 25 years and I trust her and she thankfully trusts me to make the right decisions for me and my child. I like being trusted and that she knows I have a brain and can think for myself and would not do anything to put my child in danger. 5. Please don’t be afraid to give advice just remember that hundreds of other people are bombarding a pregnant lady with their advice so if she doesn’t take it don’t be offended. 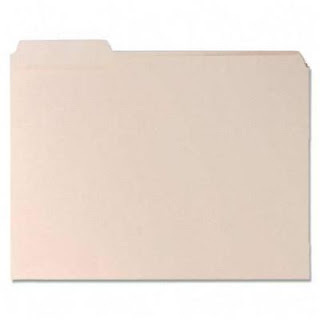 She has her doctors, parents, siblings, friends, co-workers and strangers telling their own stories and she’s busy trying to mentally file it all with “Good idea,” “Eh. We might try that,” or “Oh no she didn’t just say that…don’t ever repeat to another pregnant lady,” and “Totally ignore what that person just said.” Hahaha! Fortunately, I have had more advice that has been filed in the "Good idea" mental file folder than any of the others and for that I am thankful! 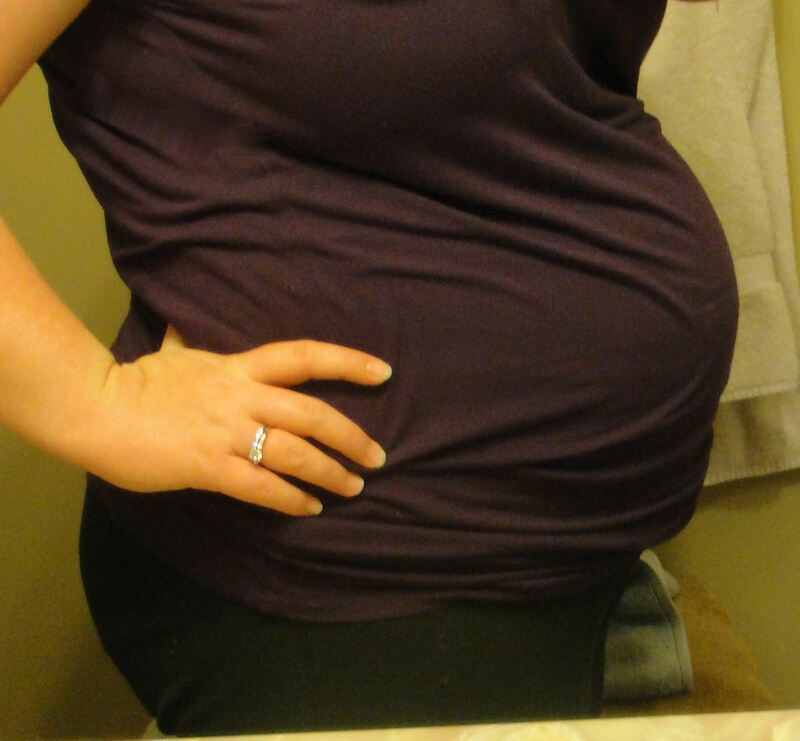 How Far Along: 27 weeks. I am in the last week of the second trimester. Sunday marked 3 exact months until my due date. It's gonna fly by! Size: 15 inches, more than a foot long, and triple what it was a 12 weeks and just over 2 pounds. Baby changes: Baby has been hearing sounds from outside the womb for a while now but it can recognize mom and dad's own voice now. If someone presses their ear against your belly they might be able to hear the heartbeat. Blake’s tried this and he can’t hear anything. We do have a stethoscope and you can hear the baby moving around but we can’t hear the heartbeat. You have to find the baby’s back and put the stethoscope on the part of the tummy where baby’s back is. How am I supposed to know where and how the baby is laying?? 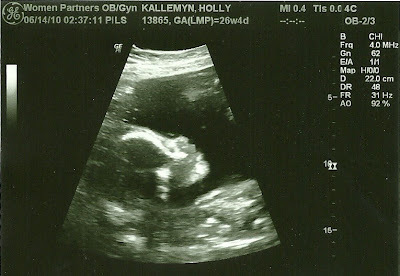 Also, while reading up on baby this week I realize that I think I've felt the baby have hiccups! I thought that were light kicks but What To Expect was saying baby's hiccups feel like belly spasms. That's probably what those "really light kicks" were. Hehe. 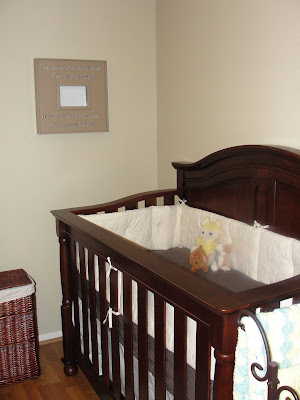 Best Moment this past week: We got the nursery pretty much done! 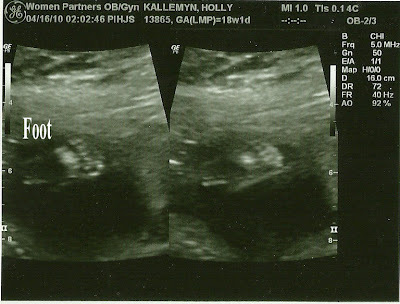 (Nursery Blog Post) and also on Monday we got to see the baby at my 26 week follow up ultrasound. (26 Week Blog Post) It was also Father’s Day weekend and Blake was celebrated my his mom, me and my parents. It was a sweet weekend. Food Craving: Food. Anything but chicken breast sounds pretty good. I’m still needing to eat every hour or so…something small, snack like, or I feel nauseous. Speaking of food...in weight gain news, I am back to my pre-pregnancy starting weight. I lost 10 pounds from the first trimester to 18 weeks but at my last two appointments, in the last 6 weeks, I gained back the 10 pounds!! Ack. I just pray that the next 13 weeks I slowly gain and I don't all of a sudden just blow up. That scares me. Now, I have been weighing every morning to check my progress. Haha. 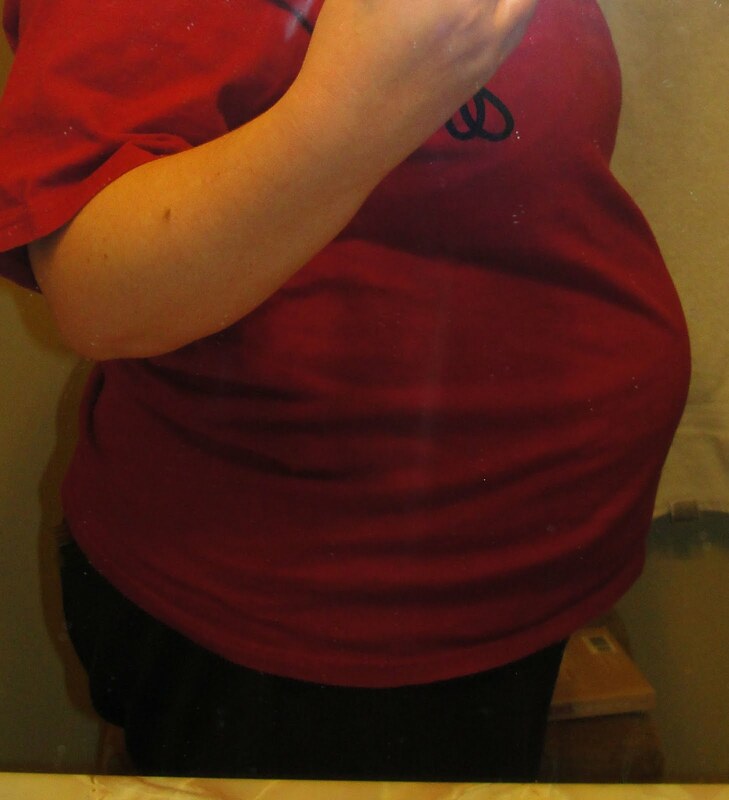 I took this last week - 26 weeks along. Doctor says I'm measuring perfectly with my due date. What I am looking forward to: I have more pregnant friends than I know what to do with!! I have already found out what two of them are having and I am looking forward to finding out what the others are having as well! It’s always fun waiting for that phone call/text to see what I need to buy for their little one. Also, I’m looking forward to the really long July 4th weekend I will have. Thursday I have a doctor’s appointment that I am not looking forward to but Friday through Monday I am off and I’m looking forward to relaxing before the rest of July, August and September arrive…those are going to be VERY busy months. The next few weeks will be filled with family and friends and I can't wait to see everyone! Symptoms: My hips have been hurting and of course my back. When hasn’t my back hurt? I also have carpal tunnel syndrom now. My right hand and upper arm are numb contstatly. Doctor said it's normal with pregnancy because of the water retention and swelling. And, boy am I swelling. I've been told by many that the first trimester is when you are sick and tired (Luckily, I wasn't sick, just tired) the second trimester is when you're full of energy and happy, and the third trimester is when you're back to being tired and miserable. I think I'm for sure feeling some of the not so fun side-effects of the third, "miserable," trimester. 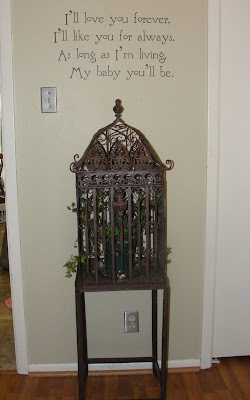 I got the itch this week to fix up the baby's nursery. Yes, we still have three months but I guess the nesting feeling doesn't wait. My sweet sister has a precious one year old so she had a lot of baby stuff that Brinley has just started out-growing and she offered to bring it down when they came in March for their spring break visit. So, there have been boxes and trash bag covered baby items in the guest room since then and I've just had enough of looking at the clutter! The swing was Brinley's that my sister gave to us to use. It'll "live" in the corner, or living room probably, but it was feelin' photogenic at the time. 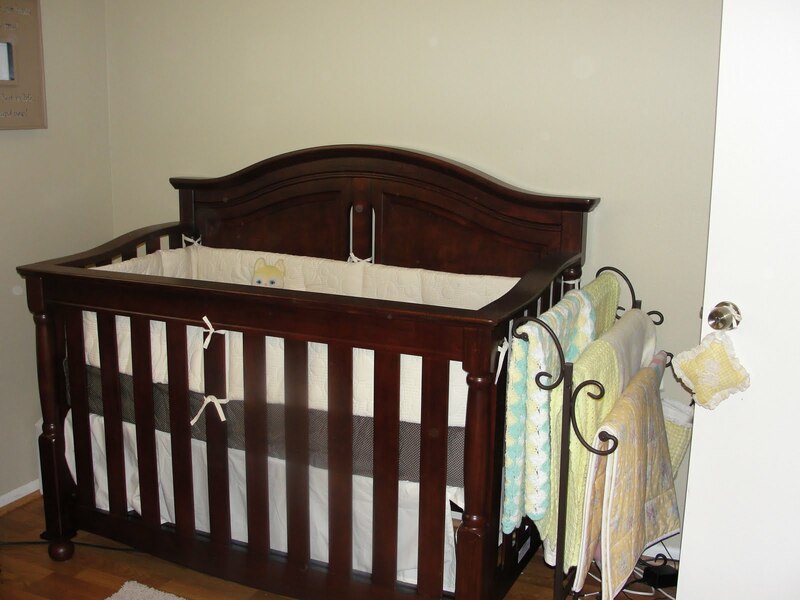 Here's the other side of the room...the crib. 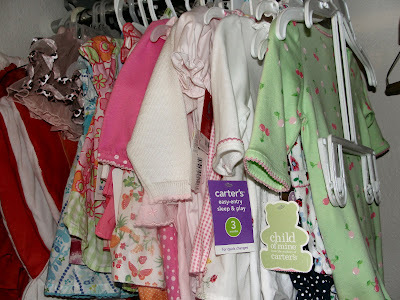 Look how many blankets Baby already has. Four are mine from when I was a baby and the other's have been sweet gifts from Blake's Aunt and Mom and my Granny. 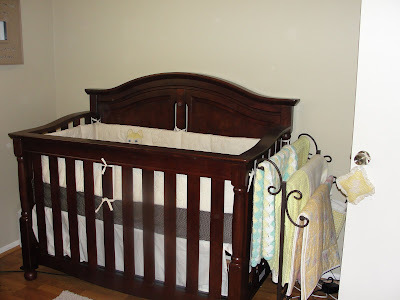 We've had the crib set up since May (we don't waste time around here!) but I've been looking for a dresser that matched for a while. The baby's room is small and the dresser that was in the set with crib was too big for the room and where I wanted to put it. So, I finally found one and we went and picked it up this morning. 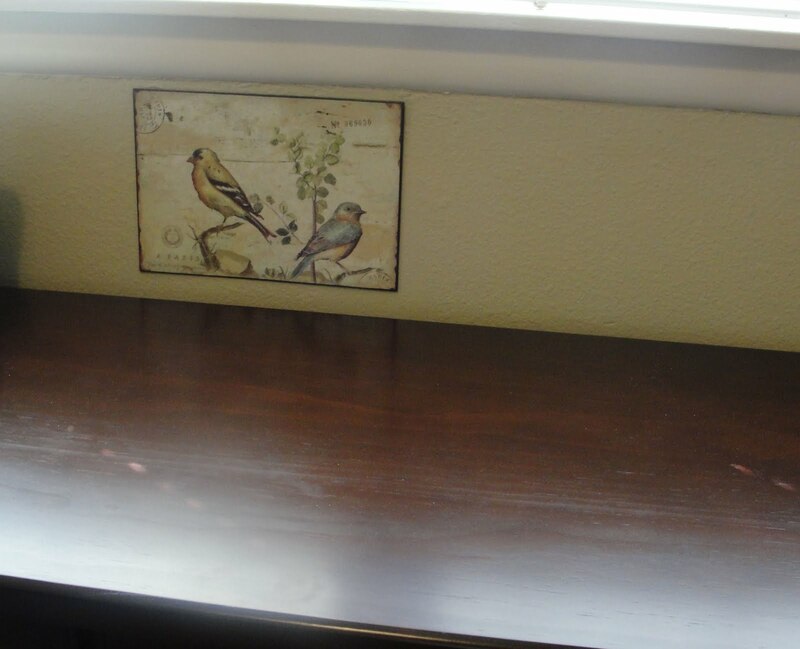 It's from Target but it's real wood, except for the drawer bottoms and back of the dresser, but it's heavy and sturdy and I think for the price we got a good deal that we can use for years. Also, for not being apart of the matching nursery set I think it matches the crib really well. Look! He's all smiles. 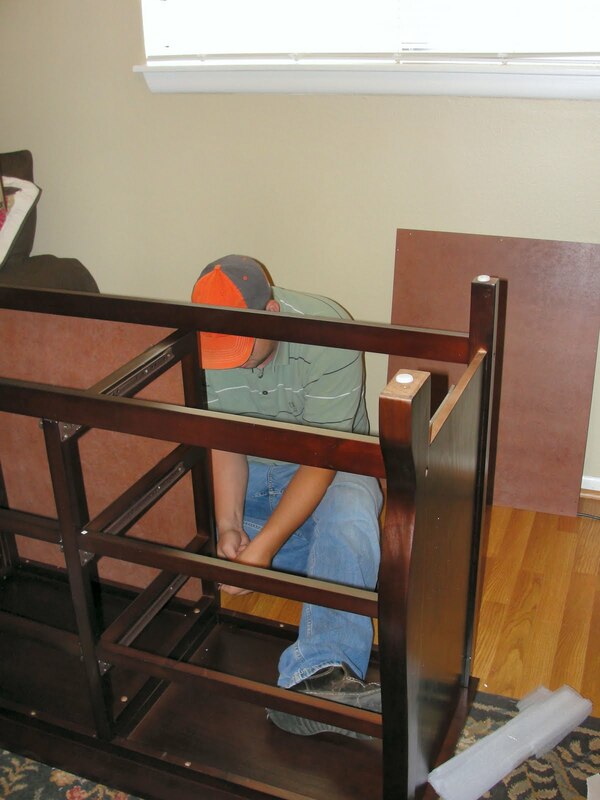 He wasn't really smiling about having to put the dresser together...Haha!! I made some joke and just happened to click at the right time!! 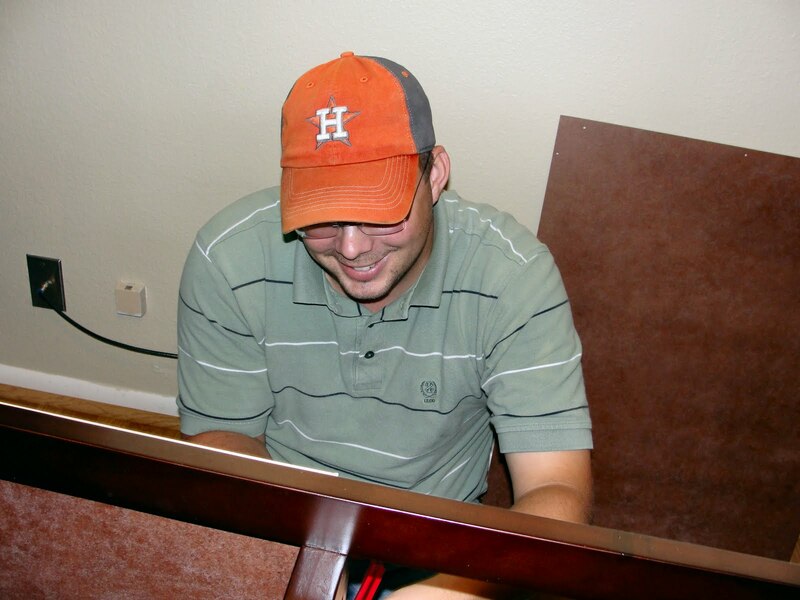 ;) He is the best and I appreciate him very much for all his help with "the man" things. So, we got the crib up, got the dresser up, and I was able to unpack the boxes of clothes my sister also brought us. We don't know what we are having but if Baby K is a girl WE ARE SET!! At least for the first 3 months. 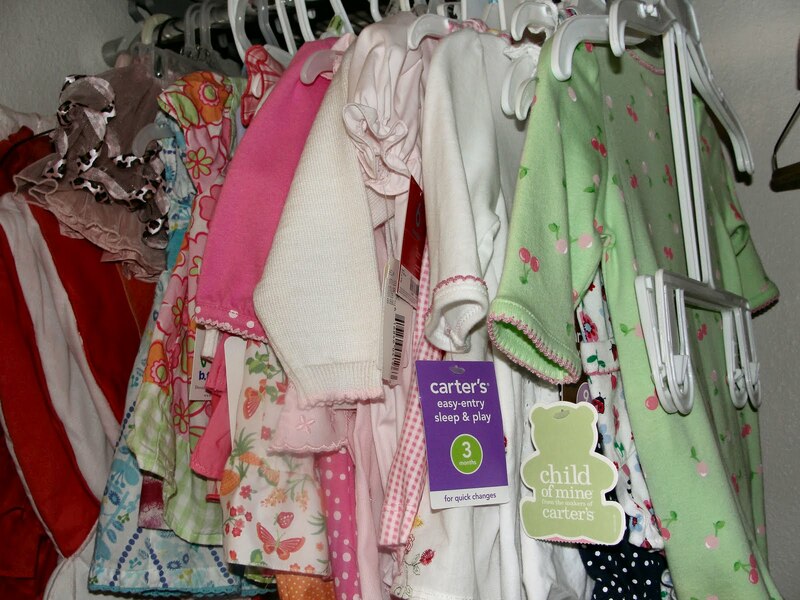 A lot of the clothes still have tags because Brinley got them as gifts but the seasons were off with the sizes and she never got to wear them. The "girl drawer." 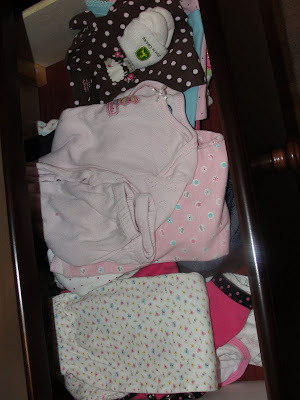 We don't have a boy drawer! Haha. If Baby is a boy he'll be sportin' some pink the first few days until we can get to the store. So, basically the rest of the room is complete. I have a few more projects to complete. 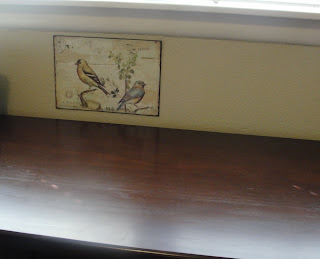 I bought a solid wood twin headboard from a garage sale for ONLY $5 (Yay!) but I am going to cover it with fabric. That is tomorrow's project. I also want to make/buy a comfy seat cushion for the bay window in the corner. 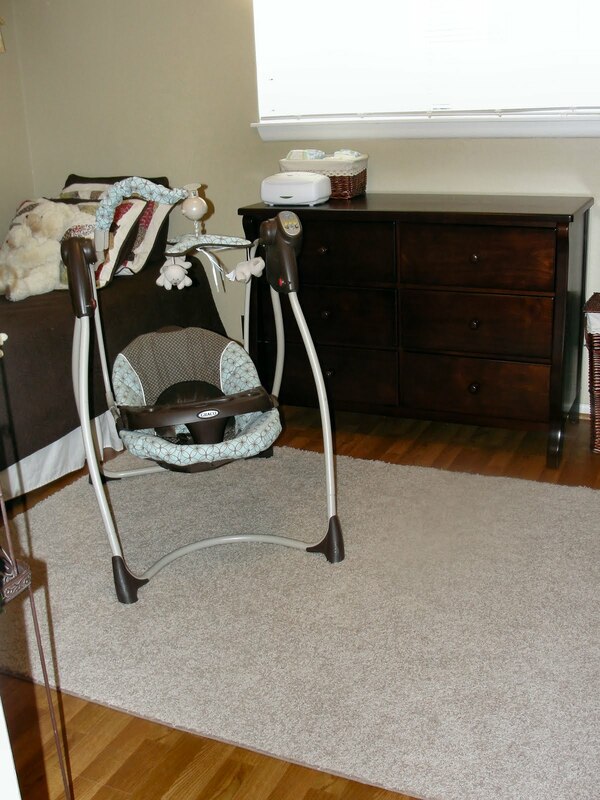 The only thing still "cluttering" the room is the cradle but that'll get put in our room when we get really close to the arrival date. So, here are the rest of the pictures of the room so far. "I'll love you forever, I'll like you for always. As long as I'm living, my baby you'll be." -Robert Munsch, from the book "Love You Forever"
The bed for those "all-night-parent-duty" nights. The little bird houses to go with the bird nursery theme. 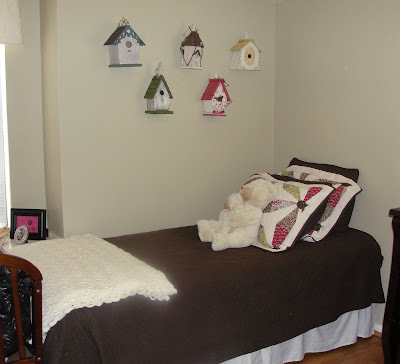 The bay window is at the foot of the bed on the wall with the bird houses and I need to find or sew a cushion for the window seat. You can see a tiny bit of the cradle at the end of the bed...filled with more baby stuff from my sister. Thanks Laura! Behind the door in the corner I kept a shelf that was already in the room for the tv/vcr/dvd for when Baby is old enough to watch Barney, or whatever kids are watching now days, and to house baby books. We've got to find a new home for the lamp, printer and paper shreader. Now that the room is pretty much complete I love walking in there even more. I can't wait to have this baby to put in there! 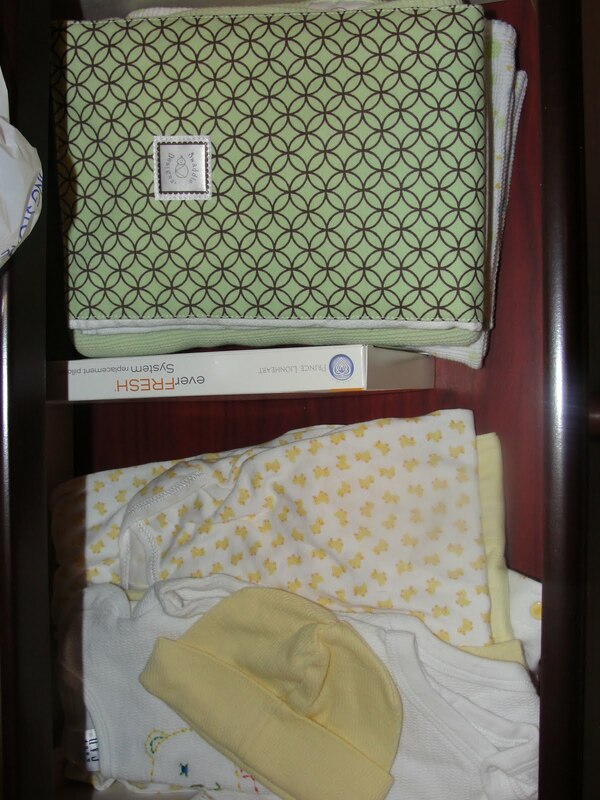 :) I'm excited to keep filling it with more and more baby stuff! I know we'll put it all to good use. What is that old saying, "Who knew something so small could use so much stuff?!" Tonight we went to dinner for Father's Day with Blake's mom and step-dad Wiley. 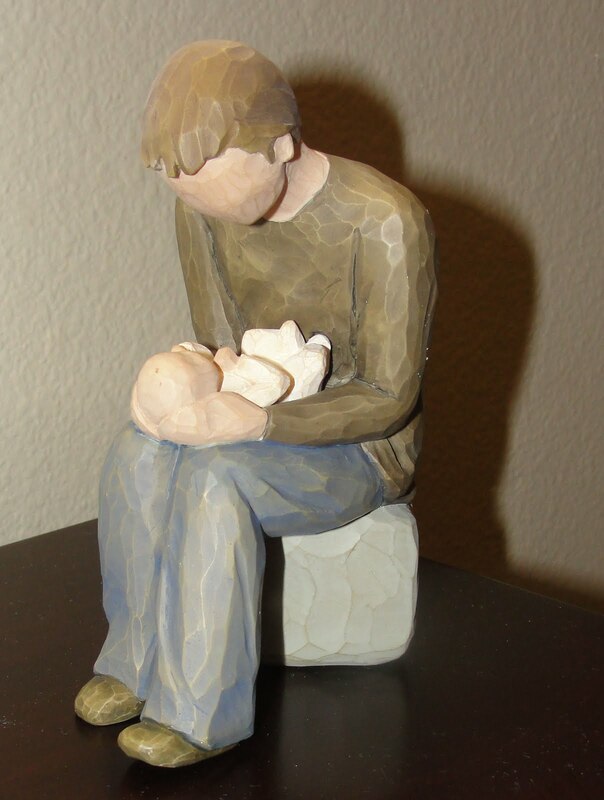 Kathy gave this to Blake and it's named "New Dad." He loves it and it's very sweet. 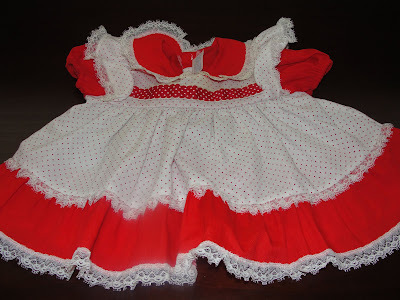 While going through the boxes I came across a lot of clothes I wore as a baby. I can't wait to put my own baby in some of the things. 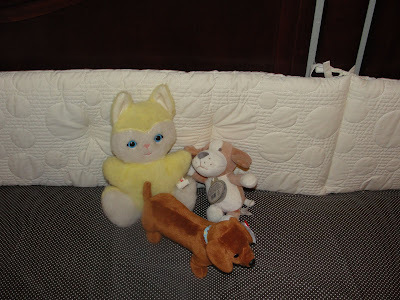 My mom also kept all my bedding and nursery decorations. I'll get pictures of those later. It was very 80's. 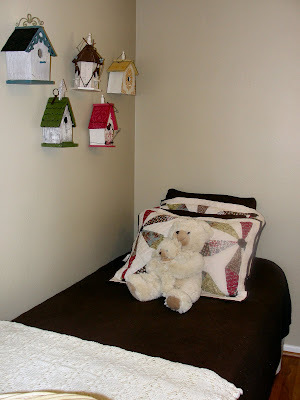 A rainbow wall hanging and yellow and white checkered bedding. 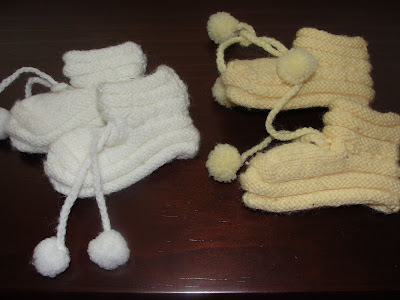 These were my little booties I wore when I was a baby. 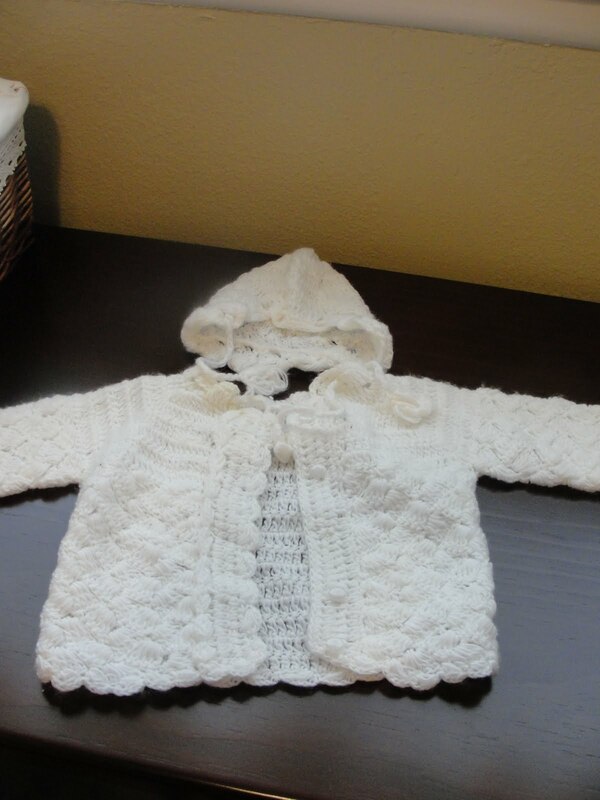 A sweet little sweater and bonnet that I wore as a baby. It'll be getting chilly when baby is going to be big enough to wear it...perfect! This is the dress I came home from the hospital in. I have been enjoying feeling Baby K move around for a good while now but these little movements are now stronger and now actually moving my belly! I am sitting here watching different areas of my belly poke out randomly. This is so funny. Let's see I ate about 30 - 45 minutes ago and had peas, carrots and rice. (I have to admit that peas and rice with a little bit of butter has become my favorite comfort food. Hey, at least it's 1/2 veggies. I think Baby likes it too...or hates it. Either way, it's full of energy and moving around like crazy. I can feel the kicks and punches so much stronger now. Ha, there goes another belly bounce. Blake got to feel Baby again and this time Baby got a "whoa!" from Daddy. Baby's tiny feet...they pack a big punch! What a day! We had a follow-up sonogram scheduled for 1:30 pm which meant the morning was going to drag by as slowly as possible because the morning knows how much I look forward to seeing our baby bounce around. But, 1:30 finally arrived. And, so did 2:30. We were still in the waiting room at 2:30 and I kindly asked the receptionist if she knew how much longer the wait would be so I could call and let my boss how late I would be in returning to work. A few minutes later the tech came and got us. Apparently she was just shootin’ the breeze or something because she seemed annoyed to have to stop whatever it was she was doing and see us. 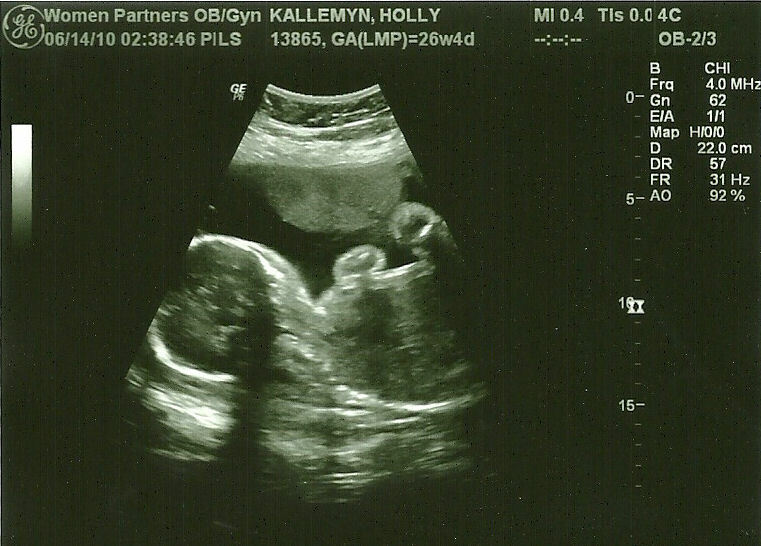 It was not the original sonogram technician we had for our first “real” sonogram. I was already annoyed because of the longer than normal wait but once we got back there she basically undressed me which was awkward since she just needed my belly. Then, she started to quickly take pictures of our baby and not tell us if everything was looking good or not. 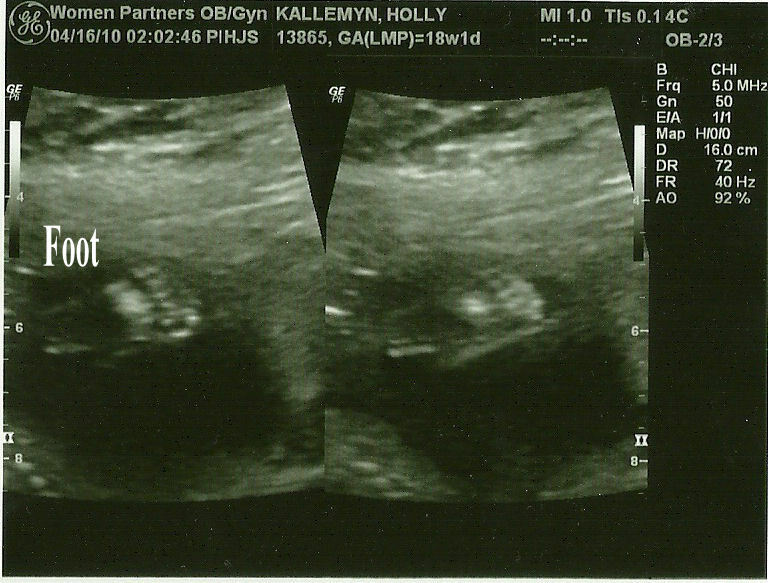 This was a follow-up sonogram so I wanted to be assured that everything was checking out ok since the first time around we didn’t get the “ok” on some of the pictures the doctor needed. But anyway…she snapped away quickly, told us to turn our heads while she was down in the nether region getting measurements of the legs so we didn’t see anything and still are going to be surprised on D-day. Blake didn’t want to be told exactly what or where they were looking so he could try and see something but still not know for sure. But, she told us to turn our heads so we did. One of the main reasons of the follow up was that they really needed to get a good picture of the face, the last time this was an issue too, apparently our child is shy (takes after Blake) and hates photographs. S/he had her arms and hands and legs and feet over her face. The sonogram tech kept pushing the wand into my abdomen harder and harder. NO WONDER Baby is protecting it’s face with it’s arms and legs…you are going to poke it’s eyes out! Then, the entire time the tech is calling our baby stubborn, which at first was like, “Ok, yeah, s/he isn’t cooperating, sorry” but about the 50th time she said it I wanted to slap her because, “Hey! That is my child. Stop insulting her/him!” She then kept telling us, “Watch out because attitudes are developed in the womb so we are going to have a stubborn child on our hands.” Now, this is something that I can say about my own child or family members but no one else should ever say that. You know? If you can’t tell, this lady rubbed me the wrong way. Then, she only gave us two pictures. 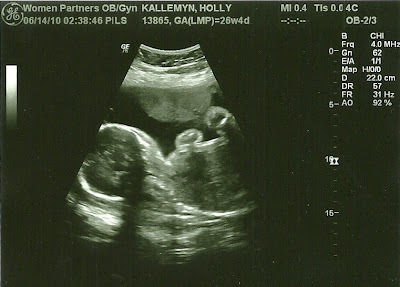 The first sonogram we left with a stack of 6 or 7 and the tech was so nice and didn’t insult my child over and over. Oh, the best part was when I had to roll over, basically almost on my stomach, for the tech to get a good profile shot of the face. The way the baby was laying the only way to see the face was from the uncomfortable position I guess. But, she poked the wand so hard into my side that the baby started freaking out kicking and punching the “air.” Haha. S/he didn’t like being bothered and didn’t like being poked so hard either. “Look at those kicks of protest! !” The tech said. Yeah, like I said, s/he doesn’t like to be poked so hard! Anyway, the rest of the appointment was great. I’m measuring about 4 days ahead of my due date but those are only 5% accurate anyway so whenever baby is ready we will be so thrilled to welcome it into the world. I used to want to be late so I could have my 12 weeks of maternity leave go through Christmas break but at this point I don’t care. My doctor said I’d eventually get that way. God is going to give us this baby when He is good and ready so here we will be, sitting, and waiting. I think this looks like Blake. When he sleeps on his back and snores. :) But for real I can see my nose and Blake's lips. I think we have a cute kiddo! We met my sister and her family in Gruene last week. They were in Austin for her husband Chris' education conference and Gruene is pretty much a middle point for Austin and Boerne. We enjoyed dinner at The Gristmill and then sat around the little main street listening to the music coming from the dance hall. We went shopping and the girls got ice cream at the General Store. It was so good to see them! I wish this photo wasn't blurry...look at those cheeks! !